For Bathtub Glass Enclosures in Fort Worth, TX, Call Our Company Today! More and more people are starting to see the appeal of upgrading features in their bathrooms. To updating fixtures or installing a new shower, it can really improve the look and feel of your bathroom. One great way to add more visual to your bathtub is by adding a glass enclosure. They are able to brighten up the bathroom, as well as give off the appearance of a larger bathroom. Whether you want a basic bathtub glass enclosure or a customized design, Armstrong's Glass & Mirror is ready to help you. Our company has many designs and styles for our customers to choose from, ensuring that when we are done, your bathroom looks better than before. We want our customers to have a bathtub enclosure that they love, so if there is a specific detail they need, we are more than happy to offer customizations. We will work closely with you to find the perfect glass tub enclosure for your bathroom, so call us today at 817-937-6267 to install bathtub glass enclosures in Fort Worth, TX. At Armstrong’s Glass & Mirror, We Also Offer Installations for Custom Glass Shower Enclosures. 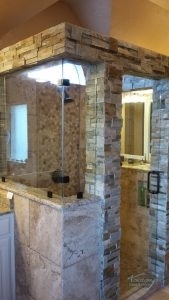 Our technicians not only specialize in custom bathtub glass enclosures, we can also customize glass shower enclosures. Choosing to install a glass shower enclosure is a great way to enhance the look of your bathroom. Depending on the aesthetic of your bathroom, we will be able to find a shower enclosure that will work for you and your bathroom. From sliding glass doors, framed, and frameless doors, we will be able to find the specific look that you want. In addition to our choice of designs, we also have a number of metal and glass options to choose from. We have a gallery of photos that our customers can look at to get a better idea of what combinations look the best. No matter what type of shower or bathtub update you are needing, we are the experts you can trust to turn your bathroom into a more luxurious and elegant room. If you need more information about our custom glass shower or bathtub glass enclosures in Fort Worth, TX, feel free to call us anytime. Additional Bathtub and Shower Services! Although we specialize in customizing bathtub and shower enclosures, we also offer other beneficial services. We want nothing more than our customers to have the bathroom of their dreams, so in order to do that, we offer many services. Our bathrooms should be a place where we not only a place where we get ready for the day but also a place for relaxing and unwinding. With our additional services, we can meet the needs of many people. From installing high-quality frameless doors to installing a handicap accessible shower for someone with limited mobility, we can ensure that we make your bathroom a place where you feel comfortable, independent, and relaxed. Below are more bathtub and shower services that we offer our customers. Coastal Framed Shower Installation Coastal framed shower doors are a great way to enhance the look of your bathroom and get a high-quality shower door. Frameless Shower Glass Want a shower enclosure that durable, is visually stunning, and doesn’t have parts that corrode? Consider a frameless shower glass door. If you want to learn more about these services, just call our technicians at 817-937-6267 today. We are more than happy to answer any questions you might have about these particular services. Armstrong's Glass & Mirror offers quality services that will transform the look of your bathroom with either a new shower or bathtub enclosure. Get the custom glass shower enclosures and bathtub glass enclosures in Fort Worth, TX that you’ve always wanted by working with our experienced specialists today. 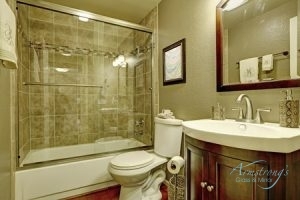 We guarantee that with our services, you will enjoy the tranquility and peace your bathroom gives you. Updated on January 14, 2019 at 3:44 pm by Armstrong Glass.